This steep climb starts at the northeast corner of Lago d’Idro at Baitoni/Camarelle (371m). Up to Bondone all is fine on a nice and wide road, but above the village a very narrow and very steep road awaits. 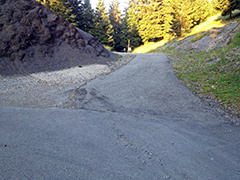 Take it easy early on as it eventually features a concrete section at around 20%, which will be hard for anyone going up here on a bicycle. This is the same climb as for Rifugio Alpo (1481m) apart from the very last part where you take west just before Alpo and follow the sign for Bocca dei Grii. The pass is 15m in on a road 800m after the Alpo road fork (asphalt ends at the pass). The road down the other side is only for mountain bikers. Other comments The main asphalt road that goes here continues toward Bocca di Cablone (1754m), but as it starts to climb the mountain in the woods it turns to gravel and it is too bad for a road bike, unfortunately, as it otherwise would have been a gorgeous road over to Magasa and among the hardest climbs in the Alps (the ridge road up there is quite popular with mountain bikers).